I’ve been using NiMH AA cells to power the amateur radio HTs on our bikes for the last several years, using homebrew 6- and 8-cell packs like this one. In addition, I cycle a handful of loose cells through the LED blinky headlights we use as rear markers. I don’t lavish much care on the packs, although they generally get recharged before they’re completely flat… if only because the radios automatically enter a low-power mode that takes some fiddling to cancel. They’re charged on a homebrew C/10 charger, typically overnight, and are uniformly warm to the touch when I take them off the charger. Slow charging is reputedly bad for the cells, although everybody seems to agree that fast charging isn’t much better; I have a 4C charger that really puts the screws to 4 cells at once. Over time the cells wear out and I’ve recently started figuring out which packs & cells to replace. I’m using a West Mountain Radio CBA II for the tests, running on our Token Windows Laptop. The X-axis divisions are its idea of how to do it; Gnuplot does a better job, but you get the general idea and exact numbers aren’t really important here. I’m using a 1 A (roughly C/2) discharge rate, because the radios draw about that much during transmit, although they run at 30-100 mA during receive. Battery capacity is inversely related to discharge rate and the usual highly over-optimistic advertised cell capacity is usually based on (at most) a C/5 or a much lower rate. 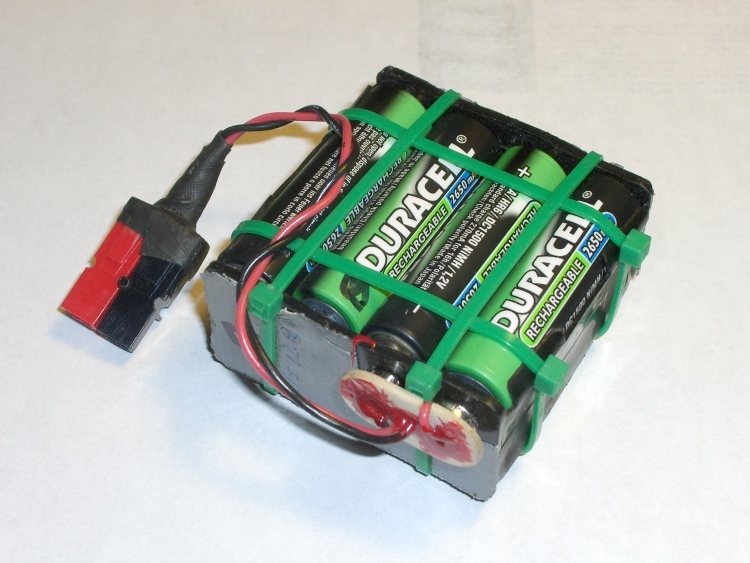 The shortest curves, the orange & black ones under 0.74 Ah, are two ancient 8-cell packs made from batteries.com cells. The cells actually have decent capacity, but the discharge voltage is much lower than it should be. 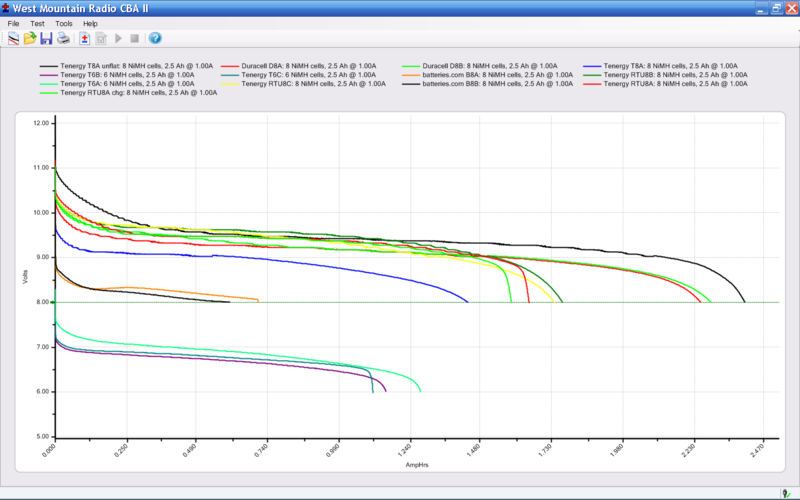 The black curve to the far right near 2.47 Ah is a freshly charged set of Tenergy 2.6 Ah cells that had been oops discharged completely flat. Other than this run, the Tenergy cells have been a major disappointment: the 6-cell packs near the bottom are running less than half their rated capacity and the 8-cell pack in blue isn’t much better. The green & red traces out there to the right at 2.23 Ah are Duracell 2.65 Ah cells that are holding up remarkably well. Recent reviews indicate that Duracell (or whoever owns them these days) reformulated the chemistry early in 2009 and the new cells are crap. These cells are colored black-and-green, which seems to be different than the new ones. The cluster of traces around 1.73 Ah are three 8-cell packs made from two dozen shiny-new Tenergy Ready-To-Use 2.3 Ah cells. I’m unimpressed so far, although they are still in their first dozen cycles. There’s obviously one weak cell in pack A that causes the abrupt fall-off in the two shortest times, but they’re all pretty much the same. I’ll run the best of the old cells in the blinky headlights, which run at a 50% duty cycle of 400 mA or so.